Not to be confused with Press Association. 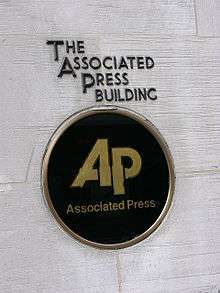 The AP headquarters in October 2008, located at 450 West 33rd Street, in New York City. The Associated Press (AP) is an American multinational nonprofit news agency headquartered in New York City that operates as a cooperative, unincorporated association. The AP is owned by its contributing newspapers and radio and television stations in the United States, all of which contribute stories to the AP and use material written by its staff journalists. Most of the AP staff are union members and are represented by the Newspaper Guild, which operates under the Communications Workers of America, which operates under the AFL–CIO. As of 2007, news collected by the AP was published and republished by more than 1,700 newspapers, in addition to more than 5,000 television and radio broadcasters. The photograph library of the AP consists of over 10 million images. The AP operates 243 news bureaus in 120 countries. It also operates the AP Radio Network, which provides newscasts twice hourly for broadcast and satellite radio and television stations. Many newspapers and broadcasters outside the United States are AP subscribers, paying a fee to use AP material without being contributing members of the cooperative. As part of their cooperative agreement with the AP, most member news organizations grant automatic permission for the AP to distribute their local news reports. The AP employs the "inverted pyramid" formula for writing that enables the news outlets to edit a story to fit its available publication area without losing the story's essentials. Cutbacks at rival United Press International in 1993 left the AP as the United States' primary news service, although UPI still produces and distributes stories and photos daily. Other English-language news services, such as the British Broadcasting Corporation, Reuters and the English-language service of Agence France-Presse, are based outside the United States. Associated Press is a not-for-profit news cooperative formed in May 1846 by five daily newspapers in New York City to share the cost of transmitting news of the Mexican–American War by boat, horse express and telegraph. The venture was organized by Moses Yale Beach (1800–68), second publisher of the The Sun, joined by the New York Herald, the New York Courier and Enquirer, The Journal of Commerce, and the New York Evening Express. Some historians believe that the Tribune joined at this time; documents show it was a member in 1849. The New York Times became a member shortly after its founding in September 1851. Initially known as the New York Associated Press (NYAP), the organization faced competition from the Western Associated Press (1862), which criticized its monopolistic news gathering and price setting practices. An investigation completed in 1892 by Victor Lawson, editor and publisher of the Chicago Daily News, revealed that several principals of the NYAP had entered into a secret agreement with United Press, a rival organization, to share NYAP news and the profits of reselling it. The revelations led to the demise of the NYAP and in December 1892, the Western Associated Press was incorporated in Illinois as the Associated Press. A 1900 Illinois Supreme Court decision (Inter Ocean Publishing Co. v. Associated Press)—that the AP was a public utility and operating in restraint of trade—resulted in AP's move from Chicago to New York City, where corporation laws were more favorable to cooperatives. When the AP was founded, news became a salable commodity. The invention of the rotary press allowed the New York Tribune in the 1870s to print 18,000 papers per hour. During the Civil War and Spanish–American War, there was a new incentive to print vivid, on-the-spot reporting. Melville Stone, who had founded the Chicago Daily News in 1875, served as AP General Manager from 1893 to 1921. He embraced the standards of accuracy, impartiality, and integrity. The cooperative grew rapidly under the leadership of Kent Cooper (served 1925–48), who built up bureau staff in South America, Europe and (after World War II), the Middle East. He introduced the "telegraph typewriter" or teletypewriter into newsrooms in 1914. In 1935, AP launched the Wirephoto network, which allowed transmission of news photographs over leased private telephone lines on the day they were taken. This gave AP a major advantage over other news media outlets. While the first network was only between New York, Chicago, and San Francisco, eventually AP had its network across the whole United States. In 1945, the Supreme Court of the United States held in Associated Press v. United States that AP had been violating the Sherman Antitrust Act by prohibiting member newspapers from selling or providing news to nonmember organizations as well as making it very difficult for nonmember newspapers to join the AP. The decision facilitated the growth of its main rival United Press International, headed by Hugh Baillie from 1935 to 1955. AP entered the broadcast field in 1941 when it began distributing news to radio stations; it created its own radio network in 1974. In 1994, it established APTV, a global video newsgathering agency. APTV merged with WorldWide Television News in 1998 to form APTN, which provides video to international broadcasters and websites. In 2004, AP moved its world headquarters from its longtime home at 50 Rockefeller Plaza to a huge building at 450 West 33rd Street in Manhattan—which also houses the New York Daily News and the studios of New York's public television station, WNET. In 2009, AP had more than 240 bureaus globally. Its mission—"to gather with economy and efficiency an accurate and impartial report of the news"—has not changed since its founding, but digital technology has made the distribution of the AP news report an interactive endeavor between AP and its 1,400 U.S. newspaper members as well as broadcasters, international subscribers, and online customers. The AP began diversifying its news gathering capabilities and by 2007 AP was generating only about 30% of its revenue from United States newspapers. 37% came from the global broadcast customers, 15% from online ventures and 18% came from international newspapers and from photography. The AP's multi-topic structure has resulted in web portals such as Yahoo! and MSN posting its articles, often relying on AP as their first source for news coverage of breaking news items. This and the constant updating evolving stories require has had a major impact on the AP's public image and role, giving new credence to the AP's ongoing mission of having staff for covering every area of news fully and promptly. The AP is also the news service used on the Wii's News Channel. In 2007, Google announced that it was paying to receive Associated Press content, to be displayed in Google News, though this was interrupted from late 2009 to mid-2010, due to a licensing dispute. 1849: the Harbor News Association opened the first news bureau outside the United States in Halifax, Nova Scotia, to meet ships sailing from Europe before they reached dock in New York. 1876: Mark Kellogg, a stringer, was the first AP news correspondent to be killed while reporting the news, at the Battle of the Little Bighorn. 1893: Melville E. Stone became the general manager of the reorganized AP, a post he held until 1921. Under his leadership, the AP grew to be one of the world's most prominent news agencies. 1899: AP used Guglielmo Marconi's wireless telegraph to cover the America's Cup yacht race off Sandy Hook, New Jersey, the first news test of the new technology. 1914: AP introduced the teleprinter, which transmitted directly to printers over telegraph wires. Eventually a worldwide network of 60-word-per-minute teleprinter machines is built. 1935: AP initiated WirePhoto, the world's first wire service for photographs. The first photograph to transfer over the network depicted an airplane crash in Morehouse, New York, on New Year's Day, 1935. 1938: AP expanded new offices at 50 Rockefeller Plaza (known as "50 Rock") in the newly built Rockefeller Center in New York City, which would remain its headquarters for 66 years. 1941: AP expanded from print to radio broadcast news. 1941: Wide World News Photo Service purchased from The New York Times. 1945: AP war correspondent Joseph Morton was executed along with nine OSS men and four British SOE agents by the Germans at Mauthausen concentration camp. Morton was the only Allied correspondent to be executed by the Axis during World War II. That same year, AP Paris bureau chief Edward Kennedy defied an Allied headquarters news blackout to report Nazi Germany's surrender, touching off a bitter episode that leads to his eventual dismissal by the AP. Kennedy maintains that he reported only what German radio already had broadcast. 1951: AP war correspondent Prague bureau chief William N. Oatis was arrested for espionage by the Communist government of Czechoslovakia. He was not released until 1953. 1994: AP launches APTV, a global video news gathering agency, headquartered in London. 2004: The AP moved its headquarters from 50 Rock to 450 W. 33rd Street, New York City. 2008: The AP launched AP Mobile (initially known as the AP Mobile News Network), a multimedia news portal that gives users news they can choose and provides anytime access to international, national and local news. AP was the first to debut a dedicated iPhone application in June 2008 on stage at Apple's WWDC event. The app offered AP's own worldwide coverage of breaking news, sports, entertainment, politics and business as well as content from more than 1,000 AP members and third-party sources. 2010: AP launched multi-device World Cup Soccer Applications providing real-time news coverage of the 2010 World Cup on desktop, Apple and Android devices. 2010: AP earnings fall 65% from 2008 to just $8.8 million. The AP also announced that it would have posted a loss of $4.4 million had it not liquidated its German-language news service for $13.2 million. 2011: AP revenue dropped $14.7 million in 2010. 2010 revenue totaled $631 million, a decline of 7% from the previous year. AP rolled out price cuts designed to help newspapers and broadcasters cope with declining revenue. 2012: Gary B. Pruitt succeeded Tom Curley to become president and CEO. Pruitt is the 13th leader of AP in its 166-year history. 2012: AP revenues continued to slide as the company posted a $193.3 million drop in 2011. 2015: AP revenues continue to decline. Company posts $183.6 million in net income. The AP is known for its polls on numerous college sports in the United States. The AP polls ranking the top 25 NCAA Division I (Football Bowl Subdivision and Football Championship Subdivision) college football and NCAA Division I men's and women's college basketball teams are the most well known. The AP composes the polls by collecting and compiling the top-25 votes of numerous designated sports journalists. The AP poll of college football was particularly notable for many years because it helped determine the ranking of teams at the end of the regular season for the collegiate Bowl Championship Series until the AP, citing conflict of interest, asked for the poll to be removed from the bowl series. Beginning in the 2005 season, the Harris Interactive College Football Poll took the AP's place in the bowl series formula. The AP poll is the longest serving national poll in college football having begun in 1936. But with the creation of the BCS in 2006 and the College Football Playoffs in 2014, the AP no longer plays a part in selection of a National Champion. The AP began its Major League Baseball Manager of the Year Award in 1959, for a manager in each league. From 1984 to 2000, the award was given to one manager in all of MLB. The winners were chosen by a national panel of AP baseball writers and radio men. The award was discontinued in 2001. Every year, the AP releases the names of the winners of its AP College Basketball Player of the Year and AP College Basketball Coach of the Year awards. It also honors a group of All-American players. In 1994, London-based Associated Press Television (APTV) was founded to provide agency news material to television broadcasters. Other existing providers of such material at the time were Reuters Television and Worldwide Television News (WTN). In 1998, AP purchased WTN and APTV left the Associated Press building in Central London and merged with WTN to create Associated Press Television News (APTN) in the WTN building, now the APTN building in Camden Town. In November 2010 the Associated Press was sued by iCopyright for breach of contract and unfair competition. It accused the AP of launching a copyright-tracking registry built upon information and business intelligence that it had misappropriated from iCopyright. Washington, D.C. bureau reporter Christopher Newton, an AP reporter since 1994, was fired by AP in September 2002 after he was accused of fabricating sources since 2000, including at least 40 people and organizations. Prior to his firing, Newton had been focused on writing about federal law-enforcement while based at the Justice Department. Some of the nonexistent agencies quoted in his stories included "Education Alliance", the "Institute for Crime and Punishment in Chicago", "Voice for the Disabled", and "People for Civil Rights". In June 2008, the AP sent numerous DMCA take down demands and threatened legal action against several blogs. The AP contended that the internet blogs were violating AP's copyright by linking to AP material and using headlines and short summaries in those links. Many bloggers and experts noted that the use of the AP news fell squarely under commonly accepted internet practices and within fair use standards. Others noted and demonstrated that AP routinely takes similar excerpts from other sources, often without attribution or licenses. AP responded that it was defining standards regarding citations of AP news. In August 2005, Ken Knight, a Louisiana photographer, sued the AP claiming that it had willfully and negligently violated Knight's copyright by distributing a photograph of celebrity Britney Spears to various media outlets including, but not limited to: truTV (formerly CourtTV), America Online and Fox News. According to court documents the AP did not have a license to publish, display or relicense the photographs. The case was settled in November 2006. In a case filed February 2005, McClatchey v. The Associated Press, a Pennsylvania photographer sued the AP for cropping a picture to remove the plaintiff's embedded title and copyright notice and later distributed it to news organizations without the plaintiff's permission or credit. The parties settled. In April 2011, Patricia Ann Lopez, a New Mexico courtroom sketch artist, sued the Associated Press claiming that the AP had violated her copyrights by reselling her images without a license and had deceptively, fraudulently and wrongfully passed off the artist's work as its own. According to court documents the AP did not have a license to resell or relicense the images. In March 2009, the Associated Press counter-sued artist Shepard Fairey over his famous image of Barack Obama, saying the uncredited, uncompensated use of an AP photo violated copyright laws and signaled a threat to journalism. Fairey had sued the AP the previous month over his artwork, titled "Obama Hope" and "Obama Progress", arguing that he did not violate copyright law because he dramatically changed the image. The artwork, based on an April 2006 picture taken for the AP by Mannie Garcia, was a popular image during the 2008 presidential election and now hangs in the National Portrait Gallery in Washington, D.C. According to the AP lawsuit filed in federal court in Manhattan, Fairey knowingly "misappropriated The AP's rights in that image". The suit asked the court to award AP profits made off the image and damages. Fairey said he looked forward to "upholding the free expression rights at stake here" and disproving the AP's accusations. In January 2011 this suit was settled with neither side declaring their position to be wrong but agreeing to share reproduction rights and profits from Fairey's work. In January 2008, the Associated Press sued competitor All Headline News (AHN) claiming that AHN allegedly infringed on its copyrights and a contentious "quasi-property" right to facts. The AP complaint asserted that AHN reporters had copied facts from AP news reports without permission and without paying a syndication fee. After AHN moved to dismiss all but the copyright claims set forth by AP, a majority of the lawsuit was dismissed. The case has been dismissed and both parties settled. In June 2010 the Associated Press was accused of having unfair and hypocritical policies after it was demonstrated that AP reporters had copied original reporting from the "Search Engine Land" website without permission, attribution, or credit. In April 2013, the Associated Press stated that it had dropped the term "illegal immigrant" from its stylebook. The blog stated that the term was dropped due to the term dehumanizing individuals. The Associated Press follows ABC, NBC, and CNN in not using the term. Jose Antonio Vargas commended the Associated Press for its decision. Syndicated writer Ruben Navarrette criticized the decision, stating the reasoning behind the decision was political correctness and called the blog "incomprehensible". Secretary of Homeland Security Janet Napolitano said of the decision, that she doesn't get involved in "vocabulary wars" and then stated "They are immigrants who are here illegally, that's an illegal immigrant". On April 23, 2013, the AP's Twitter account was hacked to release a hoax tweet about fictional attacks in the White House that left President Obama injured. This erroneous tweet resulted in a brief plunge of 130 points from the Dow Jones Industrial Average, removal of $136 billion from S&P 500 index, and the temporary suspension of their Twitter account. Although all executed trades were considered final, the Dow Jones later restored its session gains. On May 13, 2013, the Associated Press announced telephone records for 20 of their reporters during a two-month period in 2012, had been subpoenaed by the U.S. Justice Department and described these acts as a "massive and unprecedented intrusion" into news-gathering operations. The AP reported that the Justice Department would not say why it sought the records, but sources stated that the United States Attorney for the District of Columbia's office was conducting a criminal investigation into a May 7, 2012 AP story about a CIA operation that prevented a terrorist plot to detonate an explosive device on a commercial flight. The DOJ did not direct subpoenas to the AP, instead going to their phone providers, including Verizon Wireless. U.S. Attorney General Eric Holder testified under oath in front of the House Judiciary Committee that he recused himself from the leak investigations to avoid any appearance of a conflict of interest. Holder said his Deputy Attorney General, James M. Cole, was in charge of the AP investigation and would have ordered the subpoenas. The AP has been accused by its own journalists in the region of biased reporting on the Middle East. In his book Broken Spring: An American-Israeli Reporter's Close-up View of How Egyptians Lost Their Struggle for Freedom, former AP correspondent Mark Lavie claims that the AP upheld a narrative line in which Arabs and Palestinians were entirely without blame in a conflict where all guilt lay with Israel, even going so far as to refuse to print a 2008 Israeli peace proposal. Israeli journalist Matti Friedman noted the enormous influence of Human Rights Watch, which he described as having "written far more condemnations of Israel for violations of international law than of any other country in the region". Moreover, Friedman accuses AP of killing a story he wrote about the "war of words", "between Israel and its critics in human rights organizations", in the aftermath of the Israel/Gaza conflict of 2008–09. Both Lavie and Friedman specifically accuse the AP of forbidding their reporters to interview Gerald M. Steinberg of NGO Monitor (an NGO that reports on the work of NGOs, described by Friedman as "a pro-Israel outfit and by no means an objective observer", which has been characterized as being pro-Israel and is often described as right-wing); Friedman writes that in a job where he interviewed radicals of all kinds, "this professor" was "the only person I ever saw subjected to an interview ban". The AP immediately denied the accusation. In October 10 2016 the Associated Press released a "fact check" of comments made by presidential candidates during the second US presidential debate, where Republican candidate Donald Trump stated that he didn't “like Assad at all. But Assad is killing ISIS. Russia is killing ISIS”. The US National security reporter for AP, Robert Burns wrote in his fact check assessment that the statement was completely false and a lie, as although Syria’s President Bashar Assad considers ISIS to be terrorists, Burns claimed that Assad's "military is not fighting them" and is only "focused on combatting Syrian opposition groups, some of which are supported by the United States". Online commenters countered that this was inaccurate and that the AP had previously covered news of the Syrian government's 2016 military campaigns against ISIS such as in Palmyra, Deir ez-Zor, Al-Dumayr, Southwestern Ar-Raqqah and in Southeastern Ar-Raqqah. The Associated Press rewrote the item a few hours later to remove the initial "Not true" assessment to "Only partially true" and deleted their social media posts which mentioned their original assessment without an explanation. Associated Press entered in formal cooperation with Hitler's Nazi Germany in the 1930s, supplying American newspapers with material selected and produced by the Nazi party propaganda ministry. It was able to retain its access by entering into a mutually beneficial two-way cooperation with the Nazi regime. It ceded control of its output by signing up to the Schriftleitergesetz (editor's law), promising not to publish any material 'calculated to weaken the strength of the Reich abroad or at home'. Schriftleitergesetz required Associated Press to employ reporters who worked for the Nazi party's propaganda division. One photographer, Franz Roth, was a member of the SS propaganda division, whose photographs were personally chosen by Hitler. Associated Press was the only western news agency able to stay open in Nazi Germany; they continued operating until Germany declared war on the USA in 1941. Associated Press also allowed the Nazi regime to use its photo archives for its virulently anti-semitic propaganda literature, such as 'The Sub-Human' and 'The Jews in the USA' booklets. This arrangement also enabled the Nazis to cover up some of its crimes, allowing the Nazis to portray a war of extermination as a conventional war; which events were made visible and which remained invisible in AP's supply of pictures followed German interests and the German narrative of the war. The Associated Press is governed by an elected board of directors. Since January 26, 2012, the Chairman is Mary Junck, President, CEO and Chairman of Lee Enterprises. Mary Junck (Chairman) Lee Enterprises, Inc.
Donna J. Barrett Community Newspaper Holdings, Inc.
Michael Golden The New York Times Co.
Isaac Lee Univision Communications, Inc.
Gracia C. Martore Gannett Co., Inc.
William O. Nutting The Ogden Newspapers Inc.
↑ Pyle, Richard (2005-01-31). "19th-century papers shed new light on origin of the Associated Press". Associated Press. 1 2 3 "Consolidated Financial Statements" (PDF). Associated Press. April 2015. Retrieved 2016-06-02. ↑ "Associated Press Founded - This Day in History May 22". New York Natives. 2015-05-22. Retrieved 2016-03-18. ↑ "Wire That Photo". Popular Mechanics. Books.google.com. July 1937. Retrieved 2014-06-04. ↑ "Nintendo Customer Service: Wii News Channel". Nintendo. Retrieved 2009-11-17. Using the international resources of the Associated Press, the News Channel gives Wii users free access to stories in multiple categories from across the country and around the world. ↑ "Google News Becomes A Publisher". Information Week. August 31, 2007. Retrieved 2008-04-26. 'Because the Associated Press, Agence France-Presse, U.K. Press Association and the Canadian Press don't have a consumer Web site where they publish their content, they have not been able to benefit from the traffic that Google News drives to other publishers,' Josh Cohen, business product manager for Google News, explained in a blog post. ↑ "Google Stops Hosting New AP Content". Archived from the original on 12 January 2010. Retrieved 2010-01-11. ↑ "Google, AP reach deal for Google News content". CNET. August 30, 2010. Retrieved 2012-10-19. 1 2 "AP leaves 50 Rock for West 33rd Street Headquarters". The Associated Press (Press release). 2004-07-19. Retrieved 2009-11-17. ↑ Rachel L. Swarns, Darcy Eveleigh and Damien Cave (February 1, 2016). "Unpublished Black History". The New York Times. Retrieved February 1, 2016. The Times's picture agency, Wide World News Photo Service, which had staff members in London, Berlin and elsewhere, was sold to The Associated Press in 1941. ↑ The Associated Press (2009-05-21). "AP Mobile rings in one-year anniversary" Archived February 19, 2010, at the Wayback Machine., AP, Press Release. ↑ "Associated Press Reports Narrow 2009 Profit". Media Post. 2010-04-30. Archived from the original on 4 May 2010. Retrieved 2010-04-30. ↑ "Gary Pruitt, of McClatchy, to become new president and CEO of The Associated Press". Associated Press. Retrieved 14 December 2012. 1 2 AP Manager of the Year Award. Baseball-Almanac.com. Retrieved 2009-09-29. Although the award began in 1959, AP gave a "manager of the year" award in 1950 to Eddie Sawyer of the Philadelphia Phillies. "Eddie Sawyer Honored in Baseball Vote". Prescott Evening Courier. November 8, 1950. p. Section 2, Page 1. Retrieved 2010-09-16. ↑ In 1959, when the AP began its Manager of the Year Award for a manager in each league, The Sporting News Manager of the Year Award (begun in 1936) was for one manager in all of MLB. In 1983, MLB began its own Manager of the Year Award, for a manager in each league. The following year (1984) the AP changed its award to one in all of MLB. In 1986, The Sporting News changed its award to one for each league. ↑ "The Messy Falling Out Between The AP And iCopyright". Paid Content. December 7, 2010. ↑ "Fib Newton". Slate.com. October 29, 2002. Archived from the original on 8 May 2008. Retrieved 2008-04-16. ↑ "AP's Fair Use Challenge (Harvard Law)". Berkman Center for Internet and Society. 2008-06-17. Retrieved 2014-06-04. ↑ Hansell, Saul (June 16, 2008). "The Associated Press to Set Guidelines for Using Its Articles in Blogs". New York Times. Archived from the original on 9 April 2009. Retrieved 2009-04-09. The Associated Press...said that it will, for the first time, attempt to define clear standards as to how much of its articles and broadcasts bloggers and Web sites can excerpt without infringing on The A.P. 's copyright. ↑ Memmott, Mark (11 January 2011). "Shepard Fairey And AP Settle Copyright Dispute Over 'Hope' Poster". NPR. Retrieved 31 August 2012. ↑ Schonfeld, Erick (February 22, 2009). "Hot News: The AP Is Living In The Last Century". The Washington Post. Retrieved 2010-04-25. ↑ Anderson, Nate. "Who owns the facts? The AP and the "hot news" controversy". Ars Technica. ↑ The Associated Press v. All Headline News Corp. , 08 Civ. 323 (United States District Court, Southern District of New York 2009-02-17). ↑ "Citizen Media Law Project" (PDF). Retrieved 2014-06-04. ↑ Masnick, Mike (2010-06-01). "AP Sues Others For Copying Its Reporting, But Has No Problem Copying Bloggers Without Citation". TechDirt. Archived from the original on 5 June 2010. Retrieved 2010-06-01. ↑ Sullivan, Danny (2010-06-01). "How The Mainstream Media Stole Our News Story Without Credit". Daggle. Retrieved 2010-06-01. ↑ Christina Costantini (2 April 2013). "Associated Press Drops 'Illegal Immigrant' From Stylebook". ABC News. Retrieved 8 April 2013. ↑ Ruben Navarrette (6 April 2013). "Ruben Navarrette: Why 'illegal' immigrant is the right term". San Jose Mercury News. Retrieved 7 April 2013. ↑ "Associated Press under scrutiny for nixing term 'illegal immigrant' from Stylebook". Fox News. 3 April 2013. Retrieved 7 April 2013. ↑ Samantha Murphy (April 23, 2013). "AP Twitter Hack Falsely Claims Explosions at White House". Mashable. Retrieved April 23, 2013. ↑ "Fake Tweet Erasing $136 Billion Shows Markets Need Humans". Bloomberg. April 23, 2013. Retrieved April 23, 2013. ↑ Sanchez, Raf (2013-05-13). "US Justice Department secretly seizes Associated Press phone records". The Telegraph. London. Retrieved 15 May 2013. ↑ "US government secretly obtained Associated Press phone records". The Guardian. 15 May 2013. ↑ Ingram, David (2013-05-13). "Associated Press says U.S. government seized journalists' phone records". Reuters Canada. Retrieved 15 May 2013. ↑ Gallagher, Ryan. "Verizon Wireless Secretly Passed AP Reporters' Phone Records to Feds". Slate. Retrieved 20 May 2013. ↑ Curry, Tom. "Holder addresses AP leaks investigation, announces IRS probe". NBC News. Retrieved 1 June 2013. 1 2 3 4 Matti Friedman (30 November 2014). "What the Media Gets Wrong About Israel". The Atlantic. Retrieved 10 December 2014. ↑ "Broken Spring by Mark Lavie". Times of Israel. 15 September 2014. Retrieved 10 December 2014. ↑ Lavie, Mark (August 2014). "Why Everything Reported from Gaza is Crazy Twisted". The Tower. Retrieved 10 December 2014. ↑ "Boycotting Israel: New pariah on the block". The Economist. 13 September 2007. ↑ "Ha'aretz columnist dropped by British Zionists". JTA. 31 August 2007. ↑ "Biased Wikipedia editing in Israel raises concerns of political meddling". France24. 17 June 2013. Draiman concealed the facts that he was an employee of NGO Monitor, often described as a right-wing group, and that he was using a second username, which is forbidden under Wikipedia's rules. ↑ Marcus, Lori Lowenthal (3 December 2014). "AP Disses 'Whistleblower' But a New Whistle Blows". The Jewish Press. Retrieved 10 December 2014. ↑ Bernstein, David (2 December 2014). "Blacklisting of pro-Israel watchdog organization NGO Monitor by the Associated Press". Washington Post. Retrieved 10 December 2014. ↑ Miller, Abraham (9 December 2014). "Associated Press sells out journalism principles for anti-Israel 'narrative'". The Hill. Archived from the original on 10 December 2014. Retrieved 10 December 2014. ↑ Bernstein, David (3 December 2014). "Who is right about the AP's alleged blacklisting of pro-Israel watchdog NGO Monitor?". Washington Post. Retrieved 10 December 2014. ↑ Burns, Robert (10 October 2016). "AP Fact Check: Trump wrong that Assad fights IS". Associated Press. Retrieved 11 October 2016. ↑ POOLE, PATRICK (10 October 2016). "Associated Press Botches Trump Debate Fact Check on Assad and the Islamic State, Then Botches It Again". PJ Media. Retrieved 12 October 2016. ↑ "More than 2,000 enslaved fishermen rescued in 6 months". ap.org. ap.org. Retrieved 19 February 2016. ↑ "AP claim of freeing slaves". reddit.com. reddit.com. Retrieved 19 February 2016. ↑ "AP wins Pulitzer Prize for Seafood from Slaves investigation". www.ap.org. Retrieved 2016-09-15. ↑ "Revealed: how Associated Press cooperated with the Nazis". ↑ "Associated Press und die nationalsozialistische Bildpublizistik". ↑ "Facts & Figures: AP Board of Directors". Associated Press. Retrieved 2009-11-17. Associated Press (2007). Breaking News: How the Associated Press Has Covered War, Peace and Everything Else. New York: Princeton Architectural Press. ISBN 978-1-56898-689-0. Fenby, Jonathan (1986). The International News Services. New York: Schocken Books. ISBN 0-8052-3995-2. Schwarzlose, Richard Allen (1979). The American Wire Services: A Study of Their Development as a Social Institution. New York: Arno Press. ISBN 0-405-11774-4. Schwarzlose, Richard Allen (1989). The Nation's Newsbrokers, Volume 1: The Formative Years: From Pretelegraph to 1865. Evanston, IL: Northwestern University Press. ISBN 0-8101-0818-6. Schwarzlose, Richard Allen (1990). The Nation's Newsbrokers, Volume 2: The Rush to Institution: From 1865 to 1920. Evanston, IL: Northwestern University Press. ISBN 0-8101-0819-4. Wikimedia Commons has media related to Associated Press.